Brilliant and meaningful, this timeless diamond bracelet is set in white gold chain, with a total diamond carat weight of 2.51 carat. Beautifully and simply designed, this dazzling diamond bracelet is set in yellow gold chain, with a total diamond carat weight of 2.38 carat. Brilliant and meaningful, this timeless diamond bracelet is set in white gold chain, with a total diamond carat weight of 0.11 carat. 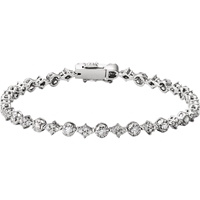 Enduring as it is lovable, this dazzling diamond bracelet is set in platinum chain, with a total diamond carat weight of 4.50 carat. Irresistibly chic, this elegant diamond bracelet is set in white gold chain, with a total diamond carat weight of 0.11 carat. Irresistibly chic, this elegant diamond bracelet is set in white gold chain, with a total diamond carat weight of 1.63 carat. 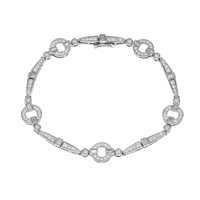 Irresistibly chic, this elegant diamond bracelet is set in white gold chain, with a total diamond carat weight of 2.38 carat. 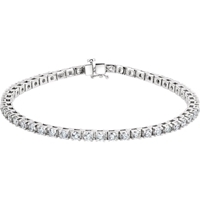 Irresistibly chic, this elegant diamond bracelet is set in platinum chain, with a total diamond carat weight of 2.38 carat. Brilliant and meaningful, this timeless diamond bracelet is set in white gold chain, with a total diamond carat weight of 0.75 carat. 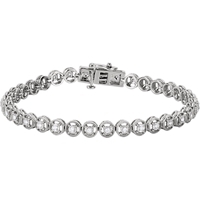 Enduring as it is lovable, this dazzling diamond bracelet is set in white gold chain, with a total diamond carat weight of 2.38 carat. Beautifully and simply designed, this dazzling diamond bracelet is set in platinum chain, with a total diamond carat weight of 2.38 carat. 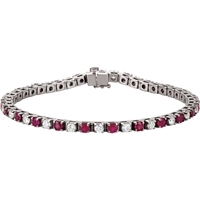 Captivate onlookers with this beautiful 0.51 carat tennis bracelet, showcasing dazzling diamonds set in complementing white gold. 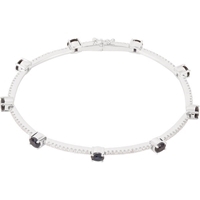 Flash some brilliance with this breathtaking 2.05 carat tennis bracelet, showcasing dazzling diamonds set in complementing white gold. Irresistibly chic, this elegant diamond bracelet is set in white gold chain, with a total diamond carat weight of 0.33 carat. 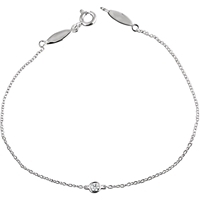 Irresistibly chic, this elegant diamond bracelet is set in white gold chain, with a total diamond carat weight of 0.25 carat. 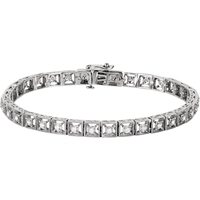 Enduring as it is lovable, this dazzling diamond bracelet is set in white gold chain, with a total diamond carat weight of 0.06 carat. Irresistibly chic, this elegant diamond bracelet is set in white gold chain, with a total diamond carat weight of 0.08 carat. Diamonds are generally appreciated in a number of forms for an anniversary, birthday or similar gift-giving occasion. However, classic and designer bracelets are the popular styles that are featured online today. Of classic style bracelets, a tennis diamond bracelet is still a sought-after piece of jewellery. The retail price for this traditional design ranges from around $600 to $10,000+ in price. 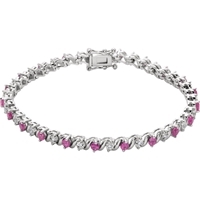 The value of the diamond bracelet is contingent on the number of diamonds used, their cut and quality and the type of metal that is featured with the stones. Typically, white or clear diamonds are set in precious metals containing 14K or 18K gold that is white, rose-tinted and yellow in hue. Bracelets made of 14K gold and diamonds are mixed with other alloys to make them more durable while 18K gold bracelets are made of pure gold and therefore are more malleable. 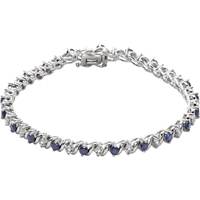 When you choose a diamond bracelet then, regardless of the style, you probably will be making a selection for a special occasion, such as a birthday, anniversary or holiday. 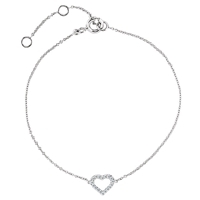 Bracelets are featured in the tennis style as well as designer designs that are represented by butterfly and oval motifs. 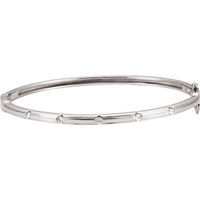 Bracelets are available that highlight rounds and pear-shaped diamonds. Cuts in the pear shape design are also referred to as teardrop diamonds and, besides bracelets, are used in earrings and pendants. Because of their unique form, pear-shaped diamonds (also called teardrops) typically are not set with other elaborate stones. 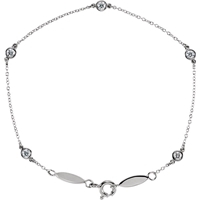 Rounds in diamonds are more traditional in nature than the other diamond cuts and are used in bracelet designs as well as solitaires for rings and necklaces.